It's never been more expensive to have kids. But it's never been cheaper to clothe and feed them, as well. So what's getting more expensive? Much was made last week of a recent study on the cost of child-rearing by economist Mark Lino at the U.S. Department of Agriculture. The total cost of raising a child born in 2012 is an estimated $241,080 – and double that if your kid attends college. That's a 23% increase from 1960. It’s easy to conclude that the cost of raising children is becoming more burdensome over time, and the historical data suggests that’s right -- but only half-right. The rising cost of child-care does create a great burden for some families. But it also represents commendable progress in our ability to meet our kids’ most basic needs. The middle class is far better off now than we were in 1960. We can afford to spend more on our kids’ well-being. In fact, the vast majority of the increased spending is for services that were once the exclusive province of the rich, such as high-quality health care and education. Let’s begin with a familiar picture. 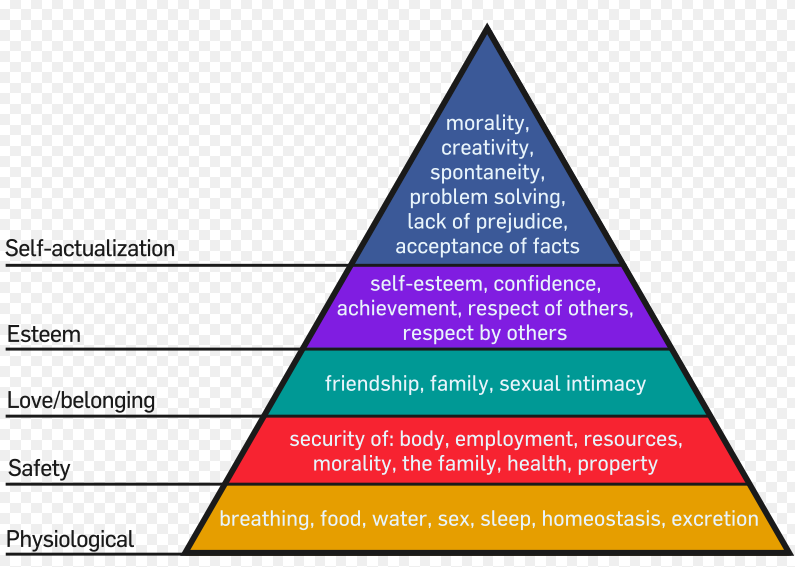 Maslow’s hierarchy of needs elegantly drew a distinction between more basic needs, like a home, and more complex needs, like health and space for creativity. For the purposes of our analysis, let’s assume: (1) food is a physiological need; (2) housing, clothing, and health care are safety needs; and (3) childcare and education -- and the transportation required to get them from childcare, education, and other activities -- are about esteem and self-actualization. You can argue with these categorizations, but as you’ll see, they clarify the overall message that some child-rearing costs have fallen dramatically while others have increased. In 1960, food accounted for 24 percent of the cost of raising a child. Half a century later, it accounts for just 16 percent of total child raising costs. Even adjusting for inflation, it is about one-fifth cheaper to feed our children today. Combine this with increasing household incomes across all categories during that same period, and we see a dramatic drop in percentage of income spent feeding our kids. Clothing our children is cheaper today than in 1960 – almost 50 percent cheaper -- but shelter and care are relatively more expensive. In particular, health costs have more than doubled. At the same time, the high costs have had happy outcomes. Infant mortality and child mortality have plummeted -- by 70% for infants according to the CDC and by 80% for children aged one to four, according to the US Department of Health and Human Services. Transportation is relatively cheaper (barely) than it were in 1960. But the childcare & education category has absolutely exploded -- from 2 percent to 18 percent of the total costs of raising a child. As a result you see a 64% increase in spending in the top three categories of Maslow’s pyramid from 1960 to 2012, with childcare & education alone growing by more than 1000%. 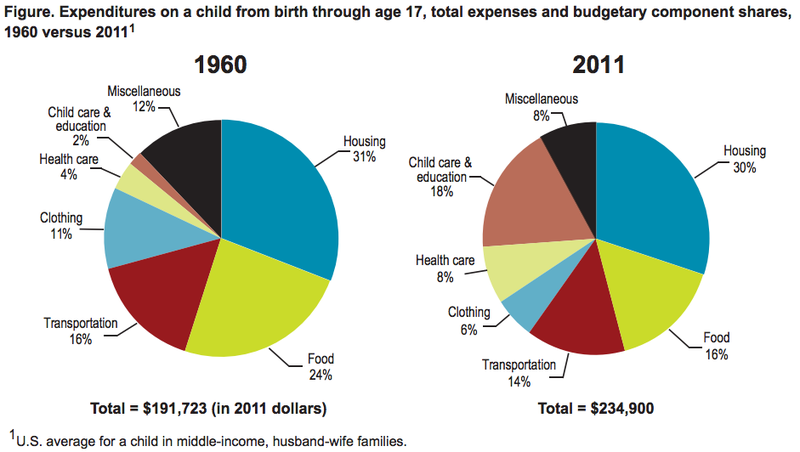 So, from 1960 to 2012, costs per-child increased 23 percent from about $195,000 to $241,000. But many costs have fallen, especially for meeting the physiological needs of young kids. Overall, we spend much less on feeding our children than we used to. Transportation and housing have grown slightly, in dollar terms. But childcare, education, and health care have zoomed ahead, driving up the overall cost of raising children. While this societal move up Maslow’s hierarchy of needs seems an unequivocal good, there are disturbing aspects of the recent statistics. For instance, as mentioned, the health care cost increases offset gains made reducing costs associated with meeting other physiological and safety needs. In other words, in 2012, it still costs parents the same amount of money it did in 1960 to get to the stage where they have the disposable income to invest in their children’s esteem and self-actualization. What this means is that for the poor, being able to personally invest in a child’s future is just as difficult or worse in 2012 than it was in 1960. Furthermore, despite less money being spent directly on food and clothes, more money is being spent managing childhood diseases – such as obesity, asthma, allergies, etc. – which have a nutritional/lifestyle component. This trend is disturbing as it indicates a failure to adequately meet physiological needs in conjunction with reduced household spending in this area. In addition to increases in health care and education spending, much of the increase in cost of raising a child can be explained by an increase in the number of dual-income households. Indeed, having two working parents necessitates additional costs for education and care, but a dual-income household can improve its bottom line at the same time. The upward trend becomes meaningless in consideration of decreasing costs of child-rearing relative to how much better-off households are with an additional income. That is to say, while childcare costs increase for dual-income households, income increases by a larger amount. What's more, family size has decreased from 3.67 in 1960 to 3.13 in 2012. Finally, the cost of something is not a perfect indication of true value; nor are resources devoted to a particular cause always proportional to returns. It may be that increased allocation of resources towards needs higher on Maslow’s pyramid from 1960 to 2012 are not seeing appropriate returns, although, as we see above, the most substantial categorical increase was in education and child care, and independent data suggest education metrics are indeed improving with time. 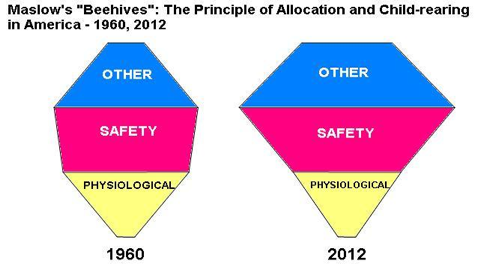 This analysis does, however, demonstrate the principle of allocation at work: Even if changing notions of societal fitness, structural problems, or other confounding factors exist, USDA data show that household resources in 2012 are increasingly allocated to places higher on Maslow’s hierarchy than they were in 1960. That parents in 2012 are able to spend less on keeping their child fed and safe and more on their child’s esteem and self-actualization is an unequivocal indication of middle-class progress. Christopher Carr is a research assistant at Boston University Medical Center and a teaching fellow at Harvard University. He writes about science and economics at Ordinary Times.